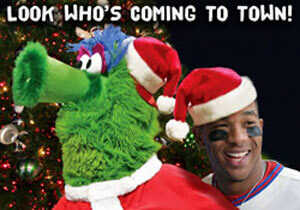 #PhantaClaus - and Ben Revere - are coming to town! 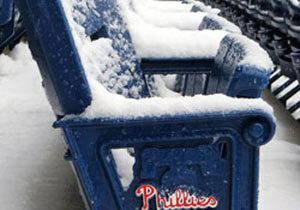 Get ready for the holidays with several free Phillies events at Citizens Bank Park, featuring unique experiences and phun photo opportunities, along with great holiday deals and free gifts for early shoppers. Fans are encouraged to arrive early and bring their own camera. Each Phillies holiday shopping event will also feature: the latest Phillies gear, merchandise, and game-used and autographed items; custom Phillies ornaments and Phillies holiday-themed gifts; and Phillies Gift Cards (available from Nov. 28-Dec. 31), which entitles the cardholder to 30% off their entire purchase during the month of January. Each event also features tickets to put under the tree: Phillies Six and Three Game Packs will be available for sale, as well as select individual game tickets (available only to purchase at the Phillies Ticket Kiosk in the Majestic Clubhouse Store - certain restrictions apply). The entrance to each event is at the Majestic Clubhouse Store at Citizens Bank Park, with free parking available in Lot S (must mention Phillies event to get free parking, located off Pattison Avenue between Broad Street and Citizens Bank Way). Please visit www.phillies.com/events or call the Majestic Clubhouse Store at 267-570-2333 for more information. 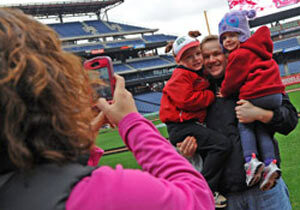 Fans can also follow the Phillies on Pinterest. Holiday music all day long, courtesy of 98.1 WOGL. Phillies Charities Memorabilia Sale: game-used bats, jerseys, caps and more! 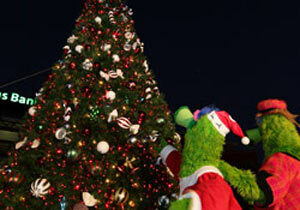 Tickets to put under the tree: Phillies Six and Three Game Packs will be available for sale, as well as select individual game tickets (available on this day only to purchase at the Phillies Ticket Kiosk in the Majestic Clubhouse Store - certain restrictions apply).